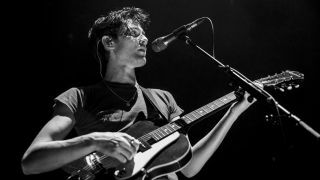 WORLD GUITAR DAY 2018: James Bay is every bit your modern guitar hero. The young Englishman’s bluesy touches, soulful ingenuity and delicate vocals have earned him Brit Awards and Grammy nominations, as well as a debut album that raced to pole position in the national charts. He’s a prime example of someone who has managed to harness all his talents and focus his ideas to serve the song. “Like many other people who end up playing guitar, it was the song Layla, specifically. That guitar sound, those notes… whatever he was doing, they captured it very well. I heard it at the age of 11 and thought, ‘That’s it, then! I’ve got to pick up a guitar and have a go at replicating those noises!’ It was like realising there was nothing I’d ever wanted to do as much as that. There are certain iconic sounds and timeless moments in music that are incredibly inspiring. How much did that inform the music you’ve been making all these years later? Your dad was instrumental in exposing you to these vintage sounds. Was he around to witness the rock’n’roll originals first-hand? “He had this great record collection so years later, when me and my brother came along, it all got exposed to us. Both of my parents love music – the guitar stuff is more from my Dad – and my mum, despite owning a Robert Cray record, is more into Motown/soul sound. I think later in my guitar playing life, it got really exciting with my dad showing me the great rock’n’roll guitar stuff and my mum getting me into something different. What were those early years like for you, learning this excitingly new, near-sacred art form? “I did it all myself in the beginning. I had friends at school learning to play and it looked great, so I figured I’d have a go too, but it’s quite private in that early stage. You start feeling a bit superhuman when you learn how to make any kind of melody or harmony come out of this box with strings on it, whether it’s a simple E chord or a 12-bar shuffle vamp… you just feel superman for that five minutes in your bedroom, with nobody else around. Did you ever take formal lessons in order to get there? “I had a little go, but I had no patience for them. I had a few in the early, early days but every time I got home from my 45-minute lesson, I would put a record on and play along – almost slacking off and forgetting all the rules I’d just been taught. I would wander around the fretboard looking for the right order of notes to replicate what I could hear on the records. How has your relationship with the guitar changed over the years? “On my second record, Electric Light, I intentionally covered it in more electric guitar sounds. But has my relationship with it changed? I guess I’ve found a way to include it in the backdrop of my songs more. As a kid, I was the guitar player in bands stood on the side; I wasn’t the frontman in the middle. I got deeply into playing guitar exclusively, so when I moved through that phase and into my more songwriter-inspired phase as a teenager, I honed in on that craft. “Victory make fantastic amps. The V40 Deluxe still blows my mind, both me and my other guitarist Andy [Cortes] used the V40 on tour over 2015 and 2016, but on the Deluxe version they’ve improved the sound even more… I just can’t say no to that! I’m really digging the Marshall Astorias too, then there’s the Tone King amps made in Baltimore. They are dreamy and fantastic-sounding. I’ve been playing through the Sky King a lot since around 2014, and if I want an even smaller amp I’ll go through the Falcon. And it’s any combination of those three amps for me – combos as opposed to stacks a lot of the time. What other pedals - even if you don’t use them - are in the collection at home? So what kind of string gauge do you prefer? “I like heavier gauges because I like having more of a fight with the guitar... I don’t want it too easy! I prefer a lighter guitar with thick strings to create more work for my hands. On my Epiphone Century I use a wound G-string like on an acoustic, usually 12s or 13s if I drop down a whole tone. Those things matter to me as much, if not more, than pedals. “Yeah, the seamless thing gets a bit dull after a while. If you think about Stevie Ray Vaughan’s best bends, there’s probably a couple of notes where he’s slipping off the strings or bent the B string and caught the G to get this weird tone or he’ll run up to the top, on the 14th fret of the high E bending up a tone and a half… on 13 gauge strings! It makes you lose your mind. It’s so sweet and perfect and yet you can hear these odd tones and other licks as he’s fighting those massive, thick strings on a Strat. That journey, that story alone, from note-to-note, is more exciting and dramatic. Do you ever have bad days as a guitar player? “Yes, just like anyone else. It’s a superhuman feeling when you are having a great time, but music can be a very human experience when it’s not going so great. It can be a reflection of our states, feelings and emotions… sometimes it might not line up in the right way. You pick the guitar up and in 15 seconds, or even 15 minutes, you’ll put the thing down. “That said, when I was 17 in my bedroom, I wouldn’t put my guitar down for six hours! There are days where I’ll still play all day long, though it’s a little different these days with so much going on. It gets harder to do that! It’s all about where the music takes you… and my life revolves around music. I’m listening to it or playing it all the time, you might think too much of one thing might get boring for someone, but not for me. As a touring musician, I might not go to as many gigs anymore, but I always have music on because I can only feel whatever it is I feel through music. Electric Light is out now.